The Muslim American boy championed by President Barack Obama is using his new worldwide fame to accuse Texans of racism and anti-Muslim discrimination. “Speaking to reporters ahead of the meeting with Davutoğlu, Mohamed said he was excited to meet the Turkish prime minister [and] said he wanted to raise awareness against racism and discrimination,” said TodaysZaman, a Turkish newspaper that support’s Turkey’s Islamist governent. The boy tweeted out a picture of his meeting with the prime minister, and his observant Muslim wife, Sare Davutoğlu, who was wearing an Islamic hood. On Sept. 14, teachers and police in Irving, Texas, detained and questioned Mohamed about a box and wiring he brought into his High School. The boy’s device was a commercial 120-volt alarm clock, first dismantled and then placed in a case where the screen could not be seen by any users. The boy also left the clock’s innards exposed, so when the power-cord was plugged in, the clock could electrocute anyone who reached inside the case to turn the alarm on or off. The device’s intended purpose was so obscure, in fact, that puzzled police and teachers thought it was a hoax-bomb. The police skepticism likely was raised because of the recent attempt by two men — both observant Muslims — to machine-gun a large group of attendees at an art exhibition in nearby Garland, Texas. The men were successfully killed by a policeman who was standing guard in the correct expectation of an attack by Muslim men. Two days after the police briefly detained the boy, and amid a social-media hurricane of progressive claims that Irving’s police were motivated by racism and dislike of Islam, Obama publicly congratulated Mohamed via a Sept. 16 tweet. 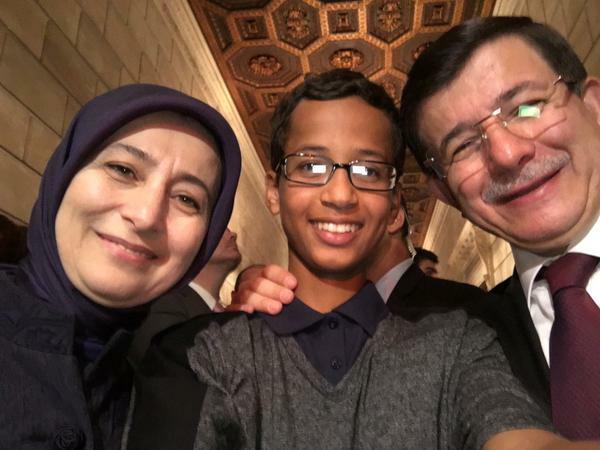 “Cool clock, Ahmed. Want to bring it to the White House? We should inspire more kids like you to like science. It’s what makes America great,” Obama tweeted. Davutoğlu is the Islamist prime minister of Turkey, who is working with President Recep Erdoğan to roll back the secular reforms imposed by Mustafa Kemal Ataturk in the 1920s and 1930s. For example, his new government rules require students to study the Koran in school. He is also trying to reassemble Turkey’s Ottoman Empire, which was destroyed by World War One. “We will again tie Sarajevo to Damascus, Benghazi to Erzurum to Batumi. This is the core of our power,” he said in 2013.